Universidad de Alicante, Campus de San Vicente del Raspeig. 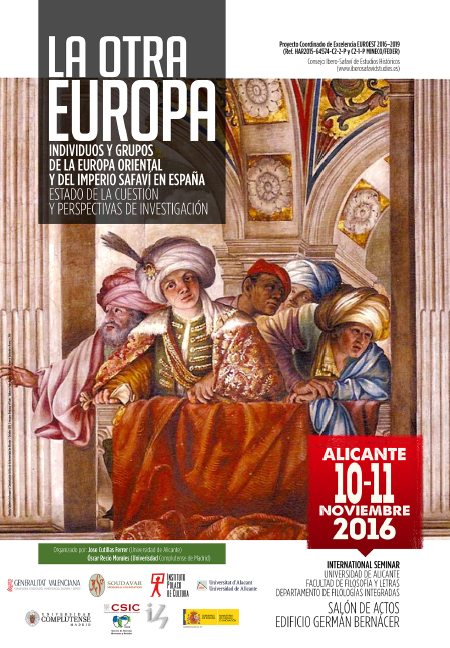 The International Seminar highlights new approaches and methods for the study of Easter Europeans and Safavid Communities in Spain, Portugal and its Wider World. The concepts of “Eastern” foreigner and the Spanish Monarchy should be interpreted broadly, here since the session hopes to discuss the presence, the exchange and acculturation of members of the Safavid Dynasty and others Eastern nationalities, particularly as these groups find fertile ground close to the court doing from trade to go-between. The concept of foreigner that occurred in the Spanish territories crossed a wide range of boundaries. Foreigner, particularly the Eastern foreigner, not only changed from nationalities to another, but also crossed political, cultural, and social borders to inserted in a new framework.